Make Greek Tzatziki with Katerina's Kouzina! This fresh yoghurt dip with garlic and cucumber goes well with so many Greek dishes! 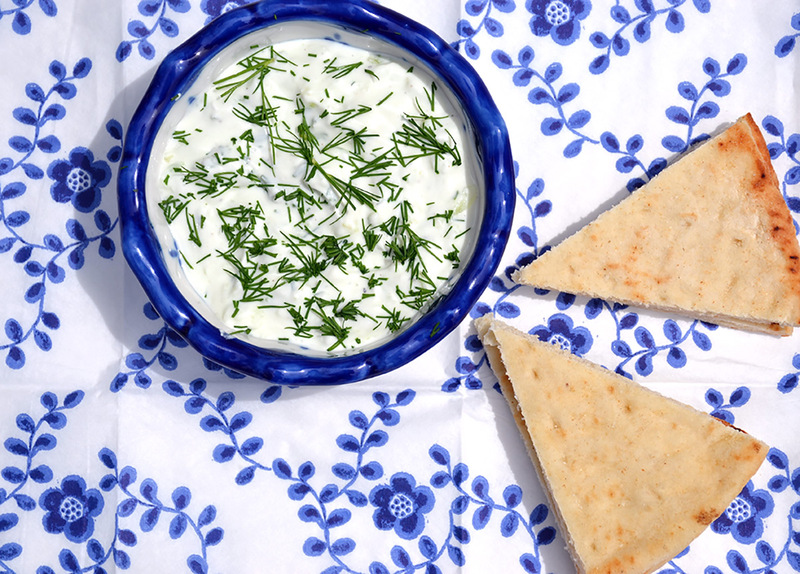 I love to eat tzatziki with a slice of warm pita or toasted bread. Have fun making this traditional Greek dip! Cucumber contains a lot of water, so you need to squeeze it out by pressing the grated cucumber in your fist. If that’s done, get some lovely garlic. During my workshops my cooking students take it from the garlic braids that can be found all over The Odyssey. Peel the garlic gloves and run them through the garlic press. Mix thoroughly the cucumber, the pressed garlic gloves, the olive oil and the yoghurt. Season the tzatziki with salt and pepper and refrigerate up to 2 hours to allow flavors to develop. When that’s done, stir again before serving, take a slice of warm pita bread and dip it in the tzatziki. You will imagine yourself in Greece! Cucumber contains a lot of water, so to be able to use the grated cucumber, you need to squeeze out the water by pressing it in your fist. Peel the garlic gloves and run them through the garlic press. Mix thoroughly the grated (and squeezed) cucumber, the pressed garlic gloves, the olive oil and the yoghurt. Season the tzatziki with salt and pepper. Refrigerate up to 2 hours to allow flavors to develop. Stir again before serving.